First up, a quick appology to falling behind a bit on the interwebs. I have a big long list of things I plan on getting to this coming week. Everything was put on hold last week following my return from Emerald Beach as I rushed to finish up as much as I could for a huge assignment for one of my classes. This weekend is a big on-campus event where Saturday (today) and Sunday will be spent in lectures and workshops for the class. I was a bit surprised to learn after signing up for classes that all three of them are being held externally only. Apparently there just aren't enough students enroled that are local to warrent having weekly meetings. Besides the obvious difficulties of it being even harder for me to get out and be social, I was very dissapointed by this because it means that I -could- be doing this degree from Emerald Beach which would save me a LOT of money on this apartment. As it is, the lease has already been signed so I don't have a choice now. I might as well make the most of it. This weekend workshop by the way, so far is excellent. The lectures have been informative and interesting (today we were discussing label design and placement and Natural History model types, display and storage) workshops involved some amusing label distance reading (amusing mostly because I was asked to do it both with my glasses on and off prooving to the entire class that I am indeed blind as a bat without my glasses on) and learning about plaster and latex molding in which we got to make our very own plaster casts of fossiles! 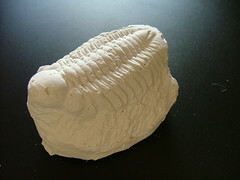 Here's my little plaster trilobite. Cute! Anyways, since I have a little while before Earth Hour begins, I thought I might take a moment to update you on the knitting front. I'm happy to say I had a very relaxing Easter weekend and although the weather was a bit dodgy some of the time, in general it was rather nice and I got a decent amount of time allowing me to just sit and knit. 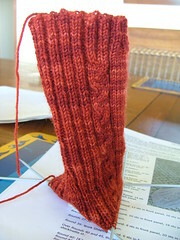 My Salto socks are coming along beautifully! 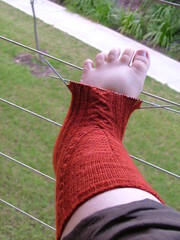 They're certainly the most complicated sock pattern I've done so far but they're just so -nice- to make. There's something about cables that are immensly satisfying! Probably because for all of the WOW factor they give back to you, they are incredibly easy to do. Here's how they looked upon departing from Emerald Beach last week. Oh, and did I mention that I LOVE the yarn? You can really see the subtle color changes in it clearly in these photos. It's squishy and soft and warm and just makes me happy to work with. I have of course progressed much further then this since. When things start to get stressful I find my breaks from all of the work involves knitting more and more. 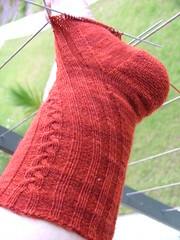 And of course once you turn the heel and pick up the gusset you're on the home stretch baby and I have to admit, I was -really- impatient to get to a point where I could try on my socks to see how they looked. I simply could not put this project down! They're beautiful. I'm thrilled! 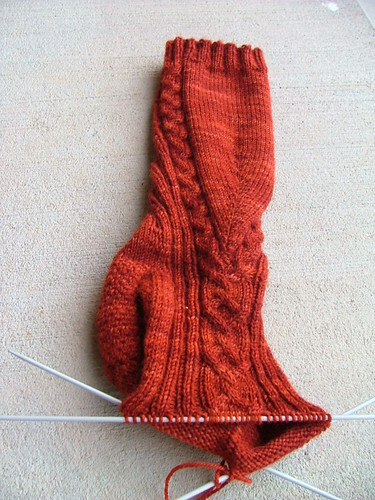 The way the pattern causes the cabling to come together at the top of the foot is so graceful. Just a really well designed sock in general. I have a nagging suspicion in the back of my head though that I'm going to start dragging when it comes to making the second sock to this pair. I get a bit itchy anyway on normal socks (I get the 'yeah, yeah, this is great and all but I've already DONE it's' and find I start to get bored with it) because it is a bit complicated I'll have to try and make sure to stay especially focused because I really want to have a full pair of these beauties. but for now I need to run off and cook myself up some dinner real quick before Earth Hour begins well and truly. The whole campus I'm living in is going to take part so I'm excited to see just how dark it's going to get. I wish it weren't so cloudy though, this would be a perfect time to try some stargazing! Love your sock. I get intimidated by the turn. I know it's probably all in my head. 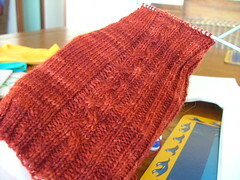 I am working of a nice sweater, haven't done that in years. At first glance, I thought that the trilobite was a hat that you had knitted. Yes, that's right! Now I bet you won't rest until you knit one! I am insulted that you haven't paid any attention to me lately! I will hit you with my Intarweb Beatstick! /wap /wap /wap!!! May spam flood your inbox! Just kidding, sweets! :) It's so good to hear from you. Catch up whenever you can! P.S. I have a friend who knits both socks at the same time. That's just how she does it. Yeah! I've seen lots of different methods including doing both socks at once, I should really see about learning that skill! mrf... all this makes me want to try and knit again. I saw some really cute socks for sale called Miss Matched Socks which came three to a packet that had similar color styles but different patterning, so you could have odd socks as a fashion statement, I thought that was pretty clever!